Money earned is all well and good, but it just can’t compare to money won. That, I think, pretty much sums up the appeal of horse-racing—to me anyhow. Sure, working sun-up to sun-down for your take-home pay builds character, but why not let a horse and jockey do all the heavy lifting while you rake in the cash? 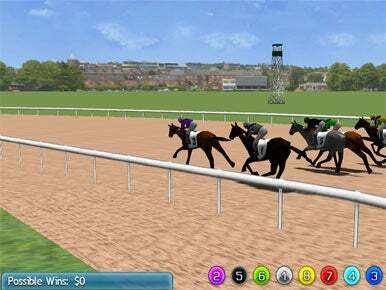 Virtual Horse Racing 3D HD looks to bring the giddy thrill of cashing a winning betting slip to your iPad. The $3 thoroughbred racing game from Netani Ariyatrakool tries its best, but in the end, it finishes out of the money. Many things attract people to the sport of kings—the grace and beauty of the horses, the strategy employed by the jockeys, the mint juleps you can get at the track—but Virtual Horse Racing 3D concerns itself largely with wagering. You peruse a racing form, place your bets, and then sit back and watch the race to see if your chosen horse delivers riches or ruins. 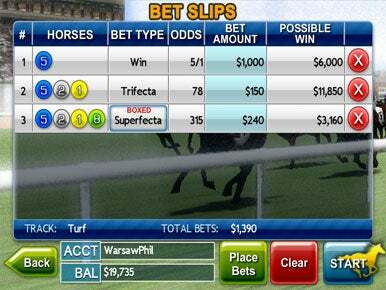 I’ll Bet: In addition to win, place, and show bets, Virtual Horse Racing 3D HD also lets you make more exotic wagers like exactas, trifectas, and superfectas. The game offers a full complement of betting options. Besides wagering on a horse to win, place, or show, you can also place quinella, exacta, trifecta, and superfecta bets. You start out with a $1,000 bankroll. Win a few wagers and your cash reserves will swell, freeing you up to place increasing exotic bets. Lose your $1,000 stake, and the game forces you to start over from scratch. I wish real-life racetracks were that forgiving. It’s easy to make informed wagers with Virtual Horse Racing 3D’s race form. The game lists the name and post position of each horse, along with the horse’s weight, age, gender, winning percentage, and most important, how it’s finished in its last six races; you’ll also find the odds for each horse. Tapping a Details button reveals even more info—the jockey, trainer, owner, more ability statistics, a somewhat superfluous video of the horse running, and the performance stretching back 10 races. Placing bets is just as simple—a few taps, and you’ll be betting like a seasoned railbird. Even though the focus of the game is wagering, Virtual Horse Racing 3D’s developer clearly put some effort into the look of the actual races. The horses move fluidly, and the racing action is pretty detailed—it’s a far cry from a similar game I played back in the 1980s on an IBM machine, where the horses were represented by numbered dots. There’s also some attention to detail with Virtual Horse Racing 3D’s sound effects—a call-to-post trumpet flourish announces the start of each race, you can hear the hooves of the horses thundering around the track, and the crowd reacts to whether you win your bets or lose. Down the Back Stretch They Go: The focus is on wagering in Virtual Horse Racing 3D HD, but the developer still put some effort into making the races look pleasing to the eye. So what’s the problem? As nice is the game is, it’s rather repetitive. Apart from whether races are run on turf or dirt, there’s no variation in either the distance of the race or the number of horses running in it. More significantly—and I’m not bragging here—the game is rather easy to beat. Base your bets on how a horse performed in past races on the same surface, and you’ll be cashing winners more often than not. I’m no expert handicapper, but in the short time I’ve been playing Virtual Horse Racing 3D, I’ve managed to turn my $1,000 stake into a $34,000-plus windfall. The virtual drinks are on me, boys! Virtual Horse Racing 3D also suffers from a lack of multiplayer functionality. The game does let you save up to three player profiles that you can rename to your heart’s content. (You’re limited to 10 characters, though, so no calling yourself Brandy-Bottle Bates or Scranton Slim.) But there’s no way to have more than one of those players placing bets on the same race—at least, none that I can find. And that adds to the repetitive and ultimately dull nature of the game—it would be much more fun to match my handicapping skills against an opponent rather than just placing bets for the sake of placing bets. Even an online leaderboard where I could compare my winnings to other players’ would liven things up. There’s the hint of a good game in Virtual Horse Racing 3D HD. If the developer can ramp up the challenge and add some way to compete against other handicappers, I’d certainly take a flyer on the game. As it stands now, though, it’s not a bet I’d recommend placing.